Stefanowski and his family were caught up in April’s massive earthquake, which claimed the lives of 9,000 people and left thousands injured. He speaks exclusively to MICHAEL McCANN about helping with the recovery effort and how life will never be the same. “It was like a horror movie,” says Jack Stefanowski, as he recalls the devastation of the Nepal earthquake in April this year. The then-national team coach was preparing for a scouting mission ahead of the summer’s South Asia Football Federation Cup when the devastating tremor hit. The massive quake reached an incredible 7.8 magnitude on the Richter scale – one of the highest ever seen – as it tore through the country, destroying almost everything in its wake. Stefanowski hid with his wife Christel, and four-year-old daughter, Lila, at their apartment on the outskirts of Kathmandu. They survived but 9,000 were not so lucky. The New York native was heavily involved in the rescue efforts following the disaster and he was shell-shocked by the scene that confronted him. He said: “There were big, famous, national statues crumbling into dust. Even then it probably wasn’t until I was hearing what the death toll was that I realised how big this was. “My family and I could so easily not be here right now and I never forget that. “Fortunately, in our area I wasn’t along the fault line so there was some destruction but not too much. However, there was a huge amount of mass devastation in a beautiful place my family has visited a week before. “To see the devastation of bridges, houses and roads crumbling, even the highway was split in half, it was mind-boggling. It looked like a war zone. “Even when I went out to provide relief I saw a car with a whole bunch of bricks on it; you felt like if you touched anything it would crumble. What Stefanowski saw has haunted him ever since. He added: “It’s quite hard to explain just how difficult a time it was and the extent of the impact it had. “I had never seen anything remotely like it and I hope that I will never see any devastation like that ever again. It was quite terrifying and took a toll mentally because you could regularly feel the tremors underneath you. “During the recovery period, I took some trips to the villages to provide food and water, and that helped me realise just how much damage there was. Sport was rocked by the quake. National volleyball coach Keshav Lal Shrestha, Paralympic athlete Jeet Bahadur Khadka and sports writer Suman Bhomjan were among those who tragically lost their lives. The domestic football league was suspended for months and Stefanowski was faced with the horrific task of attempting to account for all his players. He said: “I was in Nepal for about a week and sent messages out to make sure everyone was OK but even after I left, I had not heard anything from three or four players. “Once I got back to New York I found out that they were actually OK, so thankfully there were no serious injuries or death in the Nepalese national team. 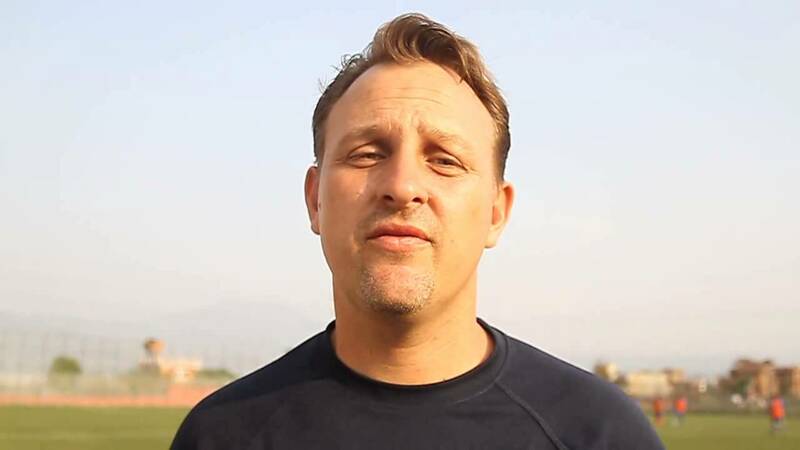 After taking on the role of Nepal coach in 2013, Stefanowski had been making real progress with the team. They reached the semi-finals of the South Asian Football Federation Championship (SAFFC) shortly after his arrival. Their impressive run – which included a 2-1 victory over India, whose population outnumbers Nepal’s almost 50:1 – was only halted by a narrow 1-0 defeat by Afghanistan. Stefanowski admits it was his greatest achievement as a national boss but reveals that further improvement was curtailed as opportunities to get his squad together became increasingly infrequent. He said: “I was fortunate enough to have good preparation time with the team. We had about three months together, we were on a roll and well-prepared for the Asian games. “We played some club teams in Kuwait and Bahrain and had some good results that built confidence leading up to the South Asian regional tournament. “We were in what was a considered a group of death with India, Pakistan and Bangladesh and it was great to finish top. “The highlight was actually to beat India for the first time in 20 years – that was probably my biggest achievement as manager of Nepal. “After the 2013 SAFFC, we have never really spent much time together as a national team, though we had friendlies here and there. The horror of the natural disaster brought the Nepalese people closer together in their efforts to support one another and attract global support for relief. The country had to be rebuilt but their spirit was not lost. Football was also a great unifier, with an exciting set of young players coming through the national ranks. Although 40-year-old Stefanowski has since returned to coaching in NYC, he still has a keen interest in Nepalese sport and believes lengthening the season would transform the game. He said: “A few weeks after the earthquake you could see the unity in the national team, the Under-19s won the regional tournament, which brought a lot of happiness to people. “It was definitely difficult, you had people living out on the streets and afraid to go back into living in their homes because they thought it would crumble. “Nepalese people are very strong and it brought them together and that created global awareness, which pulled help and attention to Nepal. “The structure is all-important, there absolutely is talent, with the youngsters, it is there — the national team has got these new players and kept them together. “There is huge success with the Under-19 age group right now. They have been together since they were about 13 and have done well on a regional level, and to some extent at the Asian Championship, too. “There have definitely been some changes with the national team but once they get into the senior side a longer season would help. “Currently the season is only three or four months and it can be quite sporadic with holidays and things like that getting in the way. “Between the federation, finances and sponsors a better league structure that runs for at least eight months of the year would definitely contribute to a stronger national team. It would mean the players are training regularly. “It is a cumulative effect because our opposition have seasons that are eight-10 months long. If you add all that extra work up across five years those opposition players are way ahead of a Nepalese player, who is only playing two-three months. Looking back on his time there, Stefanowski admits the experience has changed him as a person and the events of April 25 in Nepal will live with him forever. However, he doesn’t rule out returning to the country that gave him so much in the future. He added: “I often find myself on the subway just staring into space and thinking about Nepal, and how it is the relationship you have with the people that makes a place feel so special to you. “Nepal was such a fantastic opportunity for myself and my family because of how amazing everyone was. “I am still in touch with many of the players from the Nepal team and I am always actively looking to help them in any way I can. “It holds a special place for me because it was so good to me, and gave me that chance at the highest level –international management. “This experience has definitely brought my family closer together but having gone through that, I realised I have big ambitions. “Whether it is national team or professional elsewhere that dream hasn’t died out, it definitely took two-three months away from things to recover. “I am back coaching here in New York even if it is youth level, so it just a case of looking for opportunities to get into pro or national teams, but I would one day like to go back to Nepal. Read the latest from The Offside Rule here! Reblogged this on Michael McCann.